The Kenmore Elite 31150 is a full sized upright vacuum cleaner that is designed to rid your home of pet hair, dust, and other microscopic allergens that can trigger asthma or allergies. It requires the use of bags but they seal up quickly upon removal and do a much better job of holding the dirt than most similar sized bagless models. It offers a good combination of affordable price, cleaning performance, and decent mobility. When you compare the Kenmore to other vacuums that cost many times more you will find that it has as much or even more ability for just about any situation you need it for. And to save your arms and back, the 31150 is self propelled so you can move along at a decent pace with little effort. When they say that pet hair doesn’t stand a chance against this machine they really mean it. The 31150 Elite is built with an even more powerful inducer motor than their prior cleaners to provide upwards of 20% more power. This helps pull embedded dust particles from the deepest carpet fibers, leaving the floor much cleaner than before. The more dander and animal odor you can remove the fresher the air will feel, and the healthier the indoor environment will be. Reach those difficult places with their telescoping wand. No need to pull out the ladder to get to high window treatments, ceiling fans, curtains, or crown molding. Simply attach the Reach-Out wand to their hose and say goodbye to the cobwebs. Pet friendly attachments like their Handi-Mate™ tool quickly pulls up embedded hair while the HEPA filter captures any small organisms like dust mites and dander that you cannot see. This is a must have for homes with multiple pets. Easy to get all surfaces as the Kenmore upright has 5 different height settings. You can transition from plush carpeting to hard flooring with no difficulty. Lower maintenance design as the powerful inducer motor has beltless suction. Fewer moving (and replaceable) parts will save money over time when compared to other brands. Power Flow collection bag design means that even when it is close to full it won’t degrade performance at all. A dual wall design with extra vents around the bag maintain the same airflow as it fills. 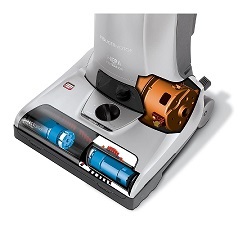 You will still have the suction power you need to keep vacuuming until the room is clean. Infrared dirt sensor activates an LED to let you know when all the dirt has been picked up (red to start, green when you are finished). This is a great feature to let you know when you can move on from a particular area as it takes all the guesswork out of cleaning. HEPA certified filter is essential for capturing tiny allergens like pollen, dust mites, and mold spores before the exhaust air comes back into your home. This helps you and your guest breathe much easier while relaxing indoors. Upright vacuums like the Kenmore 31150 Elite can feel heavy during use, especially if they are built to handle entire household cleaning. They have stronger components to last longer but this also comes with additional weight. One way the engineers at Kenmore have countered this is with a ‘Self Propelled’ design that helps the machine move forward with almost no effort on your part. While it takes a little getting used to, once you get the hang of it you will really appreciate how it seemingly walks itself across the room. This can make it more difficult to back up so keep that in mind when using it to vacuum tighter spaces. It also weighs just over 20 pounds so it isn’t easy to carry up and down stairs so if you have multiple levels make sure you are strong enough to lift it. Otherwise we would advise finding a lighter model, or keep a second (lightweight) vacuum upstairs. 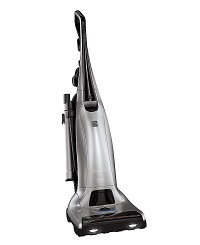 When you buy a new vacuum you are really looking for performance, and this is where the Elite Pet really shines. It has quite a bit of suction power, enough to pull in dirt and larger debris like food particles and chunks of mud. It typically takes two or less passes for even the biggest messes no matter what type of carpets you have, from high pile to area rugs. The HEPA filter is also rated to remove more than 99% of the smallest allergens from the air as it passes through. And since it comes with fast sealing bags there is almost no chance for dust to escape. You will notice when using bagless vacuums that dust will settle on the outside of the machine, especially around the collection chamber. This doesn’t happen on the Kenmore as all the dirt stays trapped inside. One thign to note when using it though, it is on the louder side of machines so if you are looking for a quiet operating brand then it is best to look elsewhere. Overall, we consider the Kenmore 31150 Elite to be one of the best combinations of price, performance, and handling. The self propelled feature helps keep the somewhat heavy upright moving forward with little to no effort. The bottom line is this machine does exactly what it is designed to do, and that is to pick up large quantities of dust and hair from your floors so your home is much cleaner than before. At just around $300 or under it represents a good bargain, especially when compared to the more expensive brands. To read more about it including consumer reviews, click here to visit our recommended online supplier.